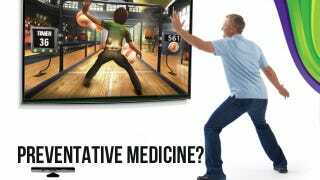 Video games might be the key to fighting off some of the debilitating symptoms of Parkinson's Disease, according to research results released this week. The pilot study, conducted by the UCSF School of Nursing and Red Hill Studios, helped more than half of the people with the disease who participated improve their balance, walking speed and stride length. The computer games were created specifically to augment physical therapy designed at helping Parkinson's patients and were funded by a $900,000 federal grant. The team described the games as something similar to what you might see on the Wii or Xbox 360's Kinect. The games award points for matching or following specific movements and has multiple difficulty levels which can be customized to a particular patient's abilities. While the games do sound an awful lot like some off-the shelf titles already available for the PS3, Wii and Xbox 360, these games required patients to wear a custom sensor suit with nine tracking sensors. Red Hill, which developed the game, said that current game technology doesn't track movement at the resolution and accuracy that the system needs to be effective. The three month trial tracked the stride length, gait velocity and balance of 20 people with moderate levels of Parkinson's disease.